Why Require Calculating Points Canada Immigration and PR? Why you Require calculating Points for Canada Immigration and PR? How to do it? Planning to migrate to Canada, but confused about your eligibility or point score? Well, the task of calculation is easy and difficult at the same time for you as a new aspirant of Canada immigration and permanent residency. It is easy in case you have understood the point-based immigration system of Canada. However, if you are still figuring out the terms, meanings and calculation process, it is rather complicated for you to understand and follow. What is the significance of Canada immigration point calculation? Canada allows skilled immigrants in the country based on a point based system. The point system helps the authorities to determine whether an applicant is eligible to come to and get PR in Canada or not. The points are given to each profile factor of an applicant, i.e. age, qualification, work experience, language proficiency level, etc. The total point you score based on your profile factors determines your eligibility as an applicant as well as to find out whether you desire the invitation for PR Visa or not. 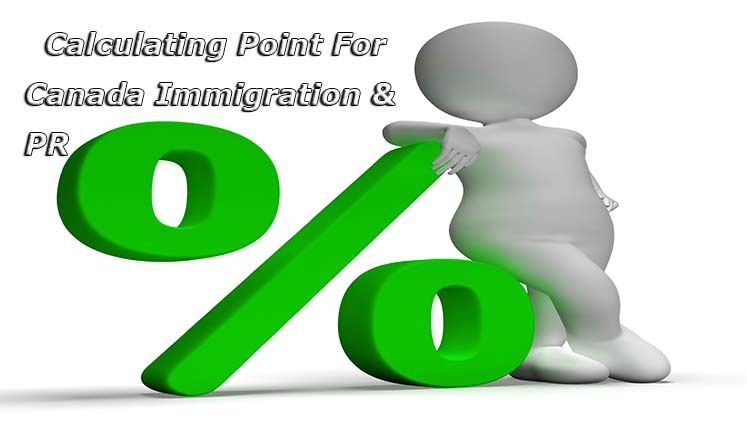 You need to calculate the immigration points for Canada immigration for two key reasons. Let’s try to understand both the scenarios. If you are applying for Canada PR as a skilled migrant, you must confirm whether you qualify to apply in the Federal Skilled Worker (FSW) program or not. In the federal skilled worker program, you must score minimum 67 points based on your age, language skills, work experience, education, etc. factors. You can confirm your eligibility for FSW by checking your points on FSW immigration point calculator for Canada. Now, the other key aspect of Canada immigration point calculation is, knowing your CRS (Comprehensive Ranking System) score in the express entry system. Express Entry system follows a Comprehensive Ranking System (CRS). As per the CRS, your profile registered in the express entry is given points based on age, education, work experience, language ability etc. factors. The Immigration Refugee and Citizenship Canada (IRCC) select the applicants from the express entry pool, through fortnightly draws. If your CRS score matches or exceeds the required CRS score in a particular draw, you become eligible to get ITA (invitation to apply) for Permanent residency in Canada. You can calculate your total CRS points through Express Entry Point Calculator. Want to confirm your eligibility for immigration from a Canada immigration expert? If you wish to confirm your eligibility or total point score for Canada immigration and PR from a reliable and registered Canada immigration expert, you can fill the free assessment form here. Alternatively, you can send your details to email id- info@visasavenue.com. If you directly want to speak to an experienced and certified Canadian Immigration and Visa Specialist at Visas Avenue, you may call at contact nos. 011-48447777, 011-46194650 (Delhi), 040-42467777 (Hyderabad), or 080-46668222 (Bangalore). Visas Avenue is a reliable and registered Visa Consultancy Service for Canada with years of experience in Canada immigration Programs and procedures. Which is the best Visa Consultancy Service in Ahmadabad for immigration to Australia or Canada?